From a squirrel glider, to a spotted python to a saltwater crocodile, the Australian Bush Buddies experience gave students the chance to learn about some of the country’s unique wildlife. For many of the students, who hail from all over the world including Germany, Singapore, France, the UK, Iran, India and China, it was their first time meeting some of Australia's quintessential critters. Master of Laws student Ziwei Yang (pictured) from China said learning about the habitats and behaviours of Australian wildlife was a wonderful opportunity. “Being able to see typical Australian animals, and touch them and get close to them is an amazing experience. I really enjoyed it,” he said. Other animals included a tawny frogmouth, blue tongue-lizard, bearded dragon, shingle-back lizard and ringtail possum. 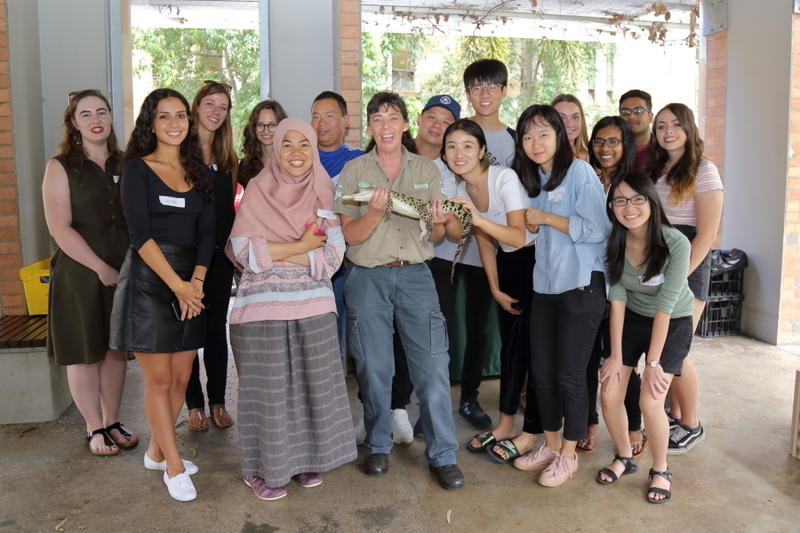 The wildlife experience was part of the TC Beirne School of Law's welcome events for international students. View the Flickr gallery to see more photos.